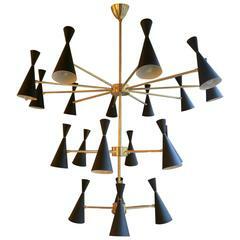 A much stylised Italian chandelier from the 1950s or possibly earlier with six trumpet shaped arms. Attributed to Arredoluce. 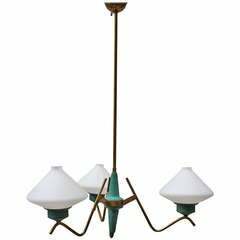 A large sixteen-arm chandelier in brass with lacquered green accents, bulb holders and ceiling rose. Re wired and restored to an exacting standard. A large 20-arm three-tiered chandelier in the Mid-Century style. The body in brass with black cone shaped shades all on brass pivotable knuckles for Directional light. 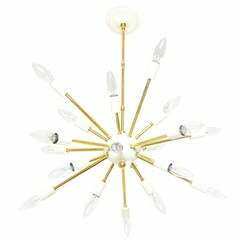 An oversized sputnik chandelier. 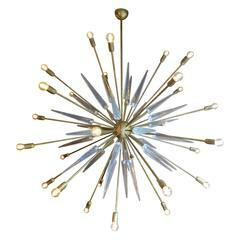 In typical Mid-Century style with 30 bulb arms and thick glass spiked mounts. A good quality contemporary decorative piece. 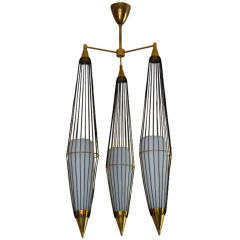 A stylish Italian 1950s brass eight-arm chandelier with frosted glass shades in the manner of Arredoluce. This chandelier was produced by Arredoluce in the 1950s. Very good vintage conditions with original patina on the brass. Great manufacturing and attention to details. 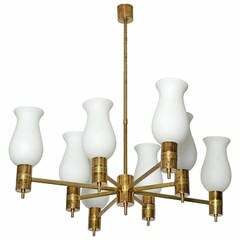 Italian chandelier, tree white opaline glass shades, brass base. 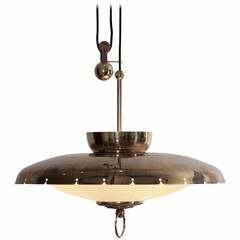 Italian (1950s) brass chandelier with six lights on bottom facing up and six lights on top facing down.